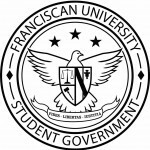 Franciscan University Student Government allocated funds for budget meetings on Nov. 7 and Nov. 12 during its Nov. 7 formal meeting. Fall Bill 57 allocated $250 to Student Government so that it could buy food for Finance Committee meetings with club representatives on Nov. 7 and the informal budget meeting on Nov. 12, notoriously the longest meeting of the semester as each club presents their budget for the spring semester to be approved by Student Government. In previous years, the informal meeting had extended into midnight and Student Government purchased pizza and other foods to accommodate the club leaders for their patience. The bill was passed unanimously. President Gabe Gessler reminded Student Government members that their presence was required at the meetings on Nov. 12 and Nov. 14, when the spring semester budget would be finalized. Treasurer Kelsey Scott-Avery said Student Government’s contingency fund sat at $31, 577.67. Student Government will next formally meet on Nov. 14 at 11 a.m. in the St. Leo Room.